I machine quilted this quilt for my mom, Betty Manuel. She is my best quilting buddy. Betty has made this quilt using half square triangles. It is a wedding gift. I love the way the dark and lights blend and mix. I was with her when she started to shop for the fabrics. I have quilted this on my long arm machine. I call this free motion pattern "spirals and flames". 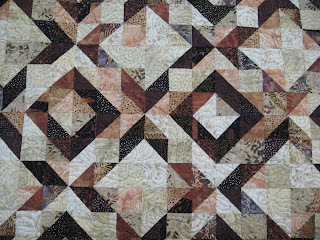 It is a nice close pattern to do on a quilt that has lots of piecing. The thread I used is a brown multicoloured cotton by Wounder Fil colour number TU34. A fuller view of the quilt. It also has a dark chocolate boarder. I believe she started with a pattern but chagned the outer area and did not put in the inner boarder. 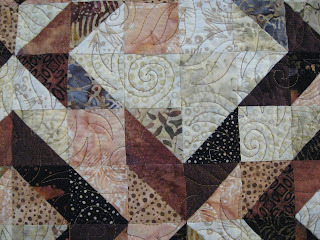 That is gorgeous and your quilting is great as always. It is "sew" beautiful! I love the colors and the quilting is excellent!